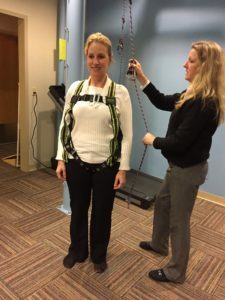 Learn about the FirstStep™ Balance System, a proprietary technology owned by First Physical Therapy. Get Your Balance Back with the Balance System located at our Mystic Office! At our Mystic Office, we offer a cutting edge First Step™ balance center. 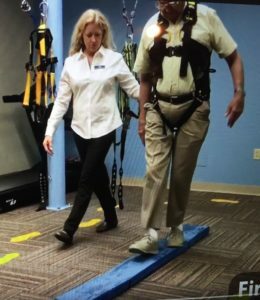 Jan Chamberlain's unique invention is designed and developed specifically to help patients gain their balance back. They can walk freely while supported by a complex and effective support system. Could you use help with your balance? Fill out the form, and we will contact you within 2 business days. First Physical Therapy was established to provide the highest quality of care with an emphasis on direct patient / therapist relationships and structured treatment programs that follow our values with integrity, honesty, compassion, and education to maximize the best functional outcome possible.